Orlando is probably best known around the world for its famous theme parks and there are plenty to choose from. Whether you want to spend a day with Mickey at Walt Disney World® Resort, or maybe take a dip with dolphins at Discovery Cove. As a result – and whatever you want – it seems like there’s probably one of the Orlando theme parks that will have something magical for you and your family to experience. The BIG ENCHILADA! This is – most of all – the number 1 reason people come to Orlando! It’s the same as stepping into a dream. There are four separate theme parks that make up Walt Disney World® Resort. In addition, there are another 2 water parks and the Disney Springs entertainment and dining complex. Orlando theme parks make the world seem far away, but as real as the smile on your face. First of all, experience your favorite Disney classics come to life at the original Magic Kingdom® theme park. In addition, discover big fun and cultures from around the globe at Epcot®. Most of all, taste and experience different foods, drinks and cultures from every part of the globe. Each countries “Pavilion” is situated around a pristine lake in the center. Create your own adventure and maybe explore the realm of creatures that inhabit our world… and our imagination… at Disney’s Animal Kingdom® theme park. Most of all, be sure to take the Safari Ride or experience the Tree of Life when you visit. Maybe you like glitz and glamour? Share the spotlight with all the razzmatazz of Hollywood at Disney’s Hollywood Studios® theme park. Seems like there’s a ride or experience for everyone at this one-of-a-kind theme park. Kids will adore the Star Wars pavilion… and it’s probably going to be difficult to drag them away! As a result, wherever you go at Walt Disney World® Resort, the only limit to fun is your imagination. Consequently, be prepared to be awed, inspired, thrilled and enchanted. From fantasy and discovery to spotlights and roaring adventure… the magic of Walt Disney World® Theme Parks will come alive all around you. 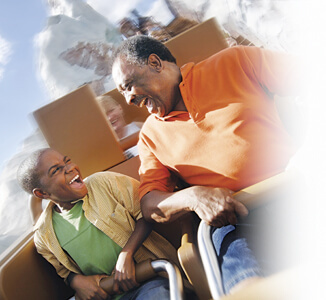 At Universal Orlando® Resort, you will find not one, but TWO amazing Orlando theme parks. Furthermore, each offers unique dining, entertainment and more all in one spectacular location. Experience the pulse-pounding thrills of Universal’s Islands of Adventure®, including Diagon Alley® and Hogsmeade® in the Wizarding World of Harry Potter®. Be awe-struck with the Amazing Adventures of Spider-Man® and more. At the separate Universal Studios – Ride the Movies® theme park, maybe step into a starring role in some of the biggest movies and TV shows ever created. Most of all – be thrilled on the 3-D ride Despicable Me Minion Mayhem, Shrek 4-D, Revenge of the Mummy® and the Hollywood Rip Ride Rockit® coaster. Immerse yourself in wonder at SeaWorld® Orlando, where the aquatic world comes alive like no place else. Perhaps this has to be one of the most truly unique Orlando theme parks! From thrilling roller coasters to family friendly attractions and animal encounters, SeaWorld offers something for everyone. Climb aboard and ride the mighty Manta, a unique coaster that lets guests ride and soar along with their back to the sky. If that’s not enough, maybe you dare to take a ride on the Mako roller coaster? Speed junkies can always jump onto Kraken, a wild roller coaster that reaches sixty five miles an hour. If you want to see wildlife up close, there’s no theme park quite like SeaWorld® Orlando. Maybe share an epic voyage with sea turtles that the entire family can enjoy on the 3D 360 TurtleTrek. There’s nothing “cooler” than experiencing Antarctica: Empire of the Penguin, a family ride that allows you to get up close and personal (be warned – it’s cold in there!). First of all feed the sting rays, or watch the Florida manatees eating through tons of cabbage, or go and see the Orcas and dolphins. There’s something for everyone to enjoy at this park. LEGOLAND Florida is the largest LEGOLAND Park in the world. This 150-acre interactive theme park features more than 50 rides, shows and attractions, restaurants and shopping. There’s also a breathtaking botanical garden and the LEGO® Water Park – all geared for families with children. This interactive theme park offers more than 50 rides, shows and attractions, plus restaurants, shopping, a fabulous botanical garden. It also has the LEGOLAND Water Park – each of them geared and designed for families to enjoy and appreciate. Take a magical trip around the world to see cities and attractions built of LEGO® bricks including California, New York, Washington DC, Las Vegas – plus the LEGO® Star Wars attraction. Enjoy the family friendly rides that can be found all over the park – with the perfect rides for toddlers in the DUPLO® Valley and at LEGO® Kingdoms. Gatorland is a 110-acre theme park and wildlife preserve located along South Orange Blossom Trail in Orlando, Florida. It was founded by Owen Godwin in 1949 and still privately owned by his family today. Gatorland has everything to enjoy for a day out. Who wouldn’t like seeing gators of all different sizes feeding and lazing around? There are also exotic birds to see, a kids water park opened in 2015, and there’s also the new Zip Line in the park. While you’re at Gatorland, clip in and zip off on an exciting outdoor adventure with the all-new Screamin’ Gator Zip Line at Gatorland. Your journey will take you along 1,200 feet of high flying, heart pounding adventure from some of the finest zip line towers in the world. Standing over seven stories tall, these amazing towers feature multilevel launch pads and breathtaking views from high above the treetops.